Jar With Most gave us the corner of Miller & Ballenger, circa 1977. Now Arnold McIntyre gives us the same spot in 2008. Nice. There was a small arcade by that corner that I used to walk to from my house on Court St. where my mother still lives. thanks for posting the "now" shot! 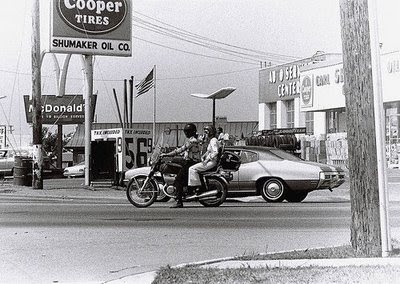 Also, based on the gas price, I'd put this photo at 1975 (it was $.62 in '77). Gillian, no Shumakers is still there, they just use the north side of the building, while the south end is The Great Divide, a Michigan/Michigan State store. The Shumaker Gas Station is gone but the Ski shop is still around. Those were the years I remember so well. Bought all my skis from Shumaker's. Remember pumping gas there in the winter time with the wind blowing, and standing in slushy gassy snow.